Focus on the main part of the picture at the beginning. Look at this picture. What can you see? 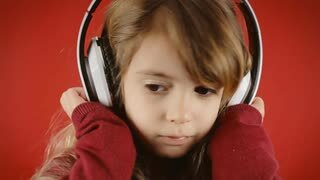 This is a picture of a little girl listening to music with headphones. Describe as much as you can. Try to use your imagination to make assumptions. For example: The girl could be listening to classical music to improve her mind. Maybe her mother makes her listen to music…or maybe she just listens for fun. She might be listening to music on a train to pass the time. Maybe it isn’t even music at all. She may be learning a language….a CD course perhaps. She looks…(happy. )/ She looks like … (my little sister). See what I mean? Talking about examples about your life while still describing the pictures…of a girl with headphones but you are more relaxed and comfortable. It is best to think about the WHO WHAT WHERE WHEN WHY HOW of each picture. Think about the subject, environment, time of day, weather, location, culture…this will give you ideas to keep you talking. Finally: Practice EVERY DAY. If you get your mind used to doing the activity you will find that during the exam you will not struggle to find ideas. Your ideas will come to your mind quickly and with little effort.